Bhopal, Jan. 24: Close on the heels of the US President Barack Obama’s Delhi visit for Republic Day, Madhya Pradesh government will be taking a big leap towards building a Global Talent Pool to rope in cooperation of NRIs and well wishers of Madhya Pradesh living in different countries and outside Madhya Pradesh. 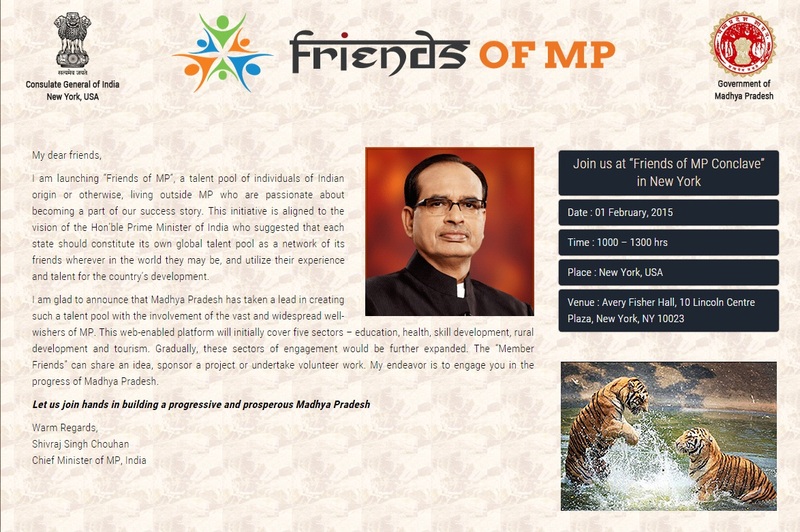 For this purpose, the “Friends of MP Conclave” will be held in New York City on February 1. State Chief Minister Shivraj Singh Chouhan is especially flying to New York city to attend the Friends of MP Conclave and hold discussions with NRIs on Madhya Pradesh’s potential, policies and programmes. The programme being organised jointly by New York-based Consulate General of India and Government of Madhya Pradesh. On this occasion the Chief Minister will be launching a website http://www.friendsofmp.com. The conclave is to be held at New York’s prominent Avery Fisher Hall, Lincoln Center Plaza from 11 am to 1 pm. All friends and well wishers of Madhya Pradesh have been invited to the function. Prime Minister Narendra Modi had advised the states at the Global Investors Summit held in Indore last October to create a Global Talent Pool to associate NRIs in the development process. Madhya Pradesh is the first state taking a major initiative in this direction. Five sectors have been chosen and piroritised to seek collaboration from the “Friends of MP”. These include education, healthcare, skill development, rural employment and tourism. Friends of MP can share an idea, sponsor a project, volunteer work and make investments. The State Government has said through a curtainraiser statement that member friends can contribute and collaborate for social initiatives and community development on the basis of their interests and expertise. All works to be undertaken with the cooperation of Friends of MP will be aligned with the vision of Prime Minister Narendra Modi. Well wishers and friends across generations and all walks of life can become Friends of MP including Indian citizens, people of Indian origin who are citizens of other countries, citizens of any country who are well wishers of MP, NGOs, civil society groups, industry associations and companies. At Friends of MP Conclave, a presentation will be made and a film screened focusing on Simhastha to be held at Ujjain in April-May 2016. The Chief Minister will extend an invitation to all to come attend the Simhastha festival. An 8-minute audio-visual programme on investment in Madhya Pradesh will also be made. Besides the MP Chief Minister, India’s Consul General Dhyaneshwar M. Mulay will also address the gathering. A dance-drama “Ardh-nareeshwar” will be a staged during the event.